Horses, great restaurants, open space galore and vibrant small towns lifted straight from a Norman Rockwell painting, all within 15 minutes of the Inn. Hike or jump on one of our complementary bikes and enjoy the 17-mile long converted Columbia Trail. as it traverses through wonderful woodland, small picturesque towns and most spectacularly, through the Ken Lockwood Gorge and the South Branch of the Raritan River. A trail ride on a beautiful, gentle Clydesdale horse from Willow Grove Farm is another year-round option. Walk outside the Inn and onto our one-mile private stretch of the South Branch of the Raritan River, known throughout the catch and release trout fishing community for its excellent and challenging waters. The guides from Califon’s local fly-fishing shop are adept in making the experience memorable, no matter your level of expertise. Take advantage of Shannon’s free fly-tying lessons each Sunday morning at 9:30. Count satellites and shooting stars around our fire pit while perfecting a nostaglic s’more or enjoying a glass of wine...both compliments of the Inn. The Valley Shepherd Creamery offers artisanal cheeses, spring lambing tours and fall harvest events. Plan ahead and book a spot at the cheese and wine dinners offered at the creamery. The historic town of Hackettstown, the hometown of M&M Mars, has several popular microbreweries with a full schedule of events. The Long Valley Pub & Brewery, located in a 200-year old stone barn and mill, has both expansive outdoor seating for warm weather and fireplace seating during cooler temps. Our own downtown Califon, accessible off the Columbia Trail, with more than 100 homes listed on the National Registry of Historic Places is the ideal place to spend an afternoon. Be sure to visit Rambo’s Country Store – it’s where we get our homemade bacon. 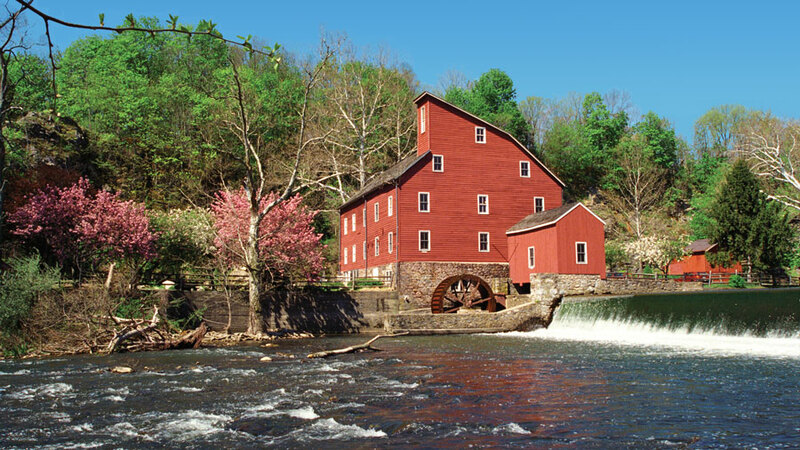 Postcard-perfect Clinton, NJ, located along the Raritan River is home to the 19th-century Red Mill Museum Village. And the noted Hunterdon Art Museum. As well as boutique shopping. Chester is another nearby destination with a walkable downtown, a full calendar of active festivals and events, and high quality national brand shopping as well. Take time to visit Chester’s peaceful, quiet and authentic farms that have been preserved through the generations – Hacklebarney Cider Mill and Riamede Farms. Our corner of New Jersey is known for its wide range of excellent restaurants, including many BYOB, all within 15 minutes driving distance of the Inn. Our innkeeper has recommendations for you! Melick’s Orchards, a 10-generation farm, offers apples, peaches, pears and pumpkins and horse-drawn wagon rides. The Cooper Mill in Chester offers visitors the chance to watch the massive water wheel power shafts and gears that turn 2,000-pound mill stones as the master miller explains the history of the mill and the vibrant community once called Milltown. Adjacent to the Mill are several miles of hiking trails. Our guests are able to play at New Jersey’s newest premier private golf course, Black Oak, about 10 minutes from the Inn.